On October 26-27, the University of Louisiana at Lafayette welcomes parents and families to visit campus so you can interact with the organizations, people and places that have become so important to your student. Parents, siblings, families, and friends of UL Lafayette students are welcome to attend Family Weekend. Why should I attend Family Weekend? 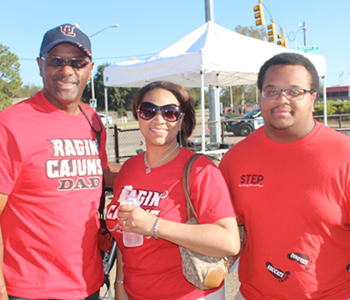 In addition to the opportunity to experience programs, activities, athletic events and more in the UL Lafayette community, attending Family Weekend also provides a wonderful chance for you to spend quality time with your student. Not only does it strengthen your relationship, but it can also provide your student with the opportunity to bridge the gap between their lives both on and away from campus. Where should I park during Family Weekend? Parking is available in EK Long parking lot with overflow in Girard Park Circle parking garage. For the game, you can take the free shuttle or pay $10 for parking at Blackham Coliseum if you prefer to park there and walk to Cajun field. Parking for families is free on Friday and Saturday. Download the map to see the parking lots. What should I do if I have additional questions about Family Weekend? Give us a call at 337-482-6276 or email deanofstudents@louisiana.edu or dana@louisiana.edu if you have questions regarding the weekend's activities. Need help finding your way around campus? Check out the campus map. We welcome you to take the time to explore campus and Lafayette on Friday. The Paul & Lulu Hilliard University Art Museum is a dynamic, education-oriented museum. Current exhibits include the work of Salvador Dali, famed Louisiana architect A. Hays Town, and selections from the George Rodrigue Foundation. Mention "Family Weekend" for free admission. Located at the corner of St. Mary Boulevard and Girard Park Drive. Happening at Super1 Foods in Youngsville. Hear from men's and women's basketball coaches and get your autographs from student-athletes and coaches. Complimentary food provided. Enjoy this free concert in Parc Sans Souci in downtown Lafayette. Downtown Alive! is one of Lafayette's longest-running traditions. Looking for a dinner spot? See the list of Lafayette Travel's recommended restaurants. Purchase a self-guided tour ticket from the Tabasco factory. Enjoy an all-you-can-eat brunch buffet and music in the Student Union Cypress Lake Dining Room. Enjoy the sights and sounds of Ragin' Cajun tailgating. Join us under the concourse in the new Russo Park baseball stadium. Seating provided and concessions available for purchase. Experience the Cajun Walk, led by the Pride of Acadiana marching band and our Ragin' Cheer and Ragin' Jazz squads. Learn more about all of the activities happening at Cajun Field before the game, including the kids zone with inflatables, face painting, and a kid-friendly DJ. Transportation to Family Tailgate at Russo Park & Cajun Field: Buses will operate continuously on Saturday beginning at 9 a.m. and ending 1 hour after the game. Buses will depart from the main entrance to the union on Mckinley Street and drop off at Cajun Field. After the game, parents and students needing transportation back to campus should exit GATE E and proceed to the student tailgating area in Bourgeois Park across from Bourgeois Hall on Cajundome Boulevard. Fight on Cajuns, fight on to victory! 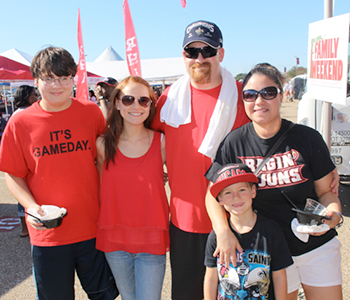 Cheer on the Louisiana Ragin' Cajuns with your family. Discounted tickets: Tickets for family are $10 plus a $5.70 transaction fee when you use the promo code: FAMILY. Buy your tickets here. Students get in free with their University ID and will be able to sit with parents and families in the stadium.